So last night was like the eye of the hurricane. You know, that eery calm that happens in the middle of a storm? That was me last night – it was almost too calm. My husband and I were in the office, he was starting his second work day, as I was catching up on some email. The girls were in their beds reading, and everything was quiet. All of a sudden we heard this loud crash, that lasted for quite a while, and then the crying started. We both called out and started running up the stairs, and our youngest daughter had knocked over her night stand light and the bulb exploded. I have never seen a light bulb shatter like this, but there were shards of glass everywhere. She was mostly upset that her light was broken and I knew that unless she had a working light, she would never go to sleep. My husband worked on cleaning up the room, while I worked on getting the base of the light bulb out of the light. Fortunately I was able to change the bulb, and all is well that ends well…that is until tonight when she cut her foot on a piece that we missed – but I got that one handled too – and I think we are done. In a different part of the circus, I am working on a big baking project this week, and I am not allowing myself any additional baking until it is done. So, what did I do this weekend? I made more pickles from Food in Jars. This time pickled sugar snap peas – I just couldn’t pass up the opportunity. The farmer’s markets are overflowing with amazing produce, and these are so delicious. The mint and ginger add such a unique flavor – I don’t even like sugar snap peas, but these I could eat all day. I am really excited about my big baking project that I will finish on Saturday, but more importantly I am excited about why I am doing it…I can’t wait to tell you all about this special occasion. Until then, I am energized, and balancing the those plates in the air, just like a true circus performer. Wash the snap peas well. Using a paring knife, trim both ends and remove the tough string that runs along the back of the peas. In a small saucepan, combine the vinegar, honey and sea salt. Heat until the honey and salt are entirely dissolved. Preparare 4 half pint jars. Place 1-2 ginger slices in the bottom of each of the jars. Divide the green onions and the mint leaves evenly between the jars. 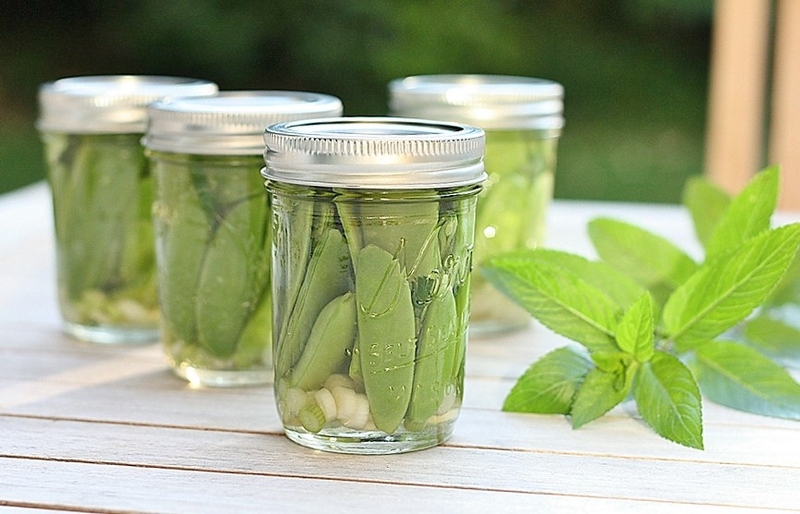 Pack the prepared snap peas into the jars. If they don’t all fit, set the aside. You may be able to sneak them in once the pickling liquid is poured. Pour the hot vinegar over the snap peas. Gently tap the jar on the counter to release any air bubbles. If you had any remaining peas, try and pack them into the jar at this time. Place a lid on the jar. Let the jar rest until it has cooled to room temperature. Refrigerate. Let these pickles sit in the vinegar for at least 24 hours before eating. They will keep up to 1 month in the refrigerator. Those sound yummy! These would be great along with some Japanese dishes! Yes, I agree!! I like serving them in a bowl with cocktails. That’s how I like to roll with things too – many things juggling at once. It’s definitely when I’m at my best as well. Glad your daughter is ok. Shattering light bulbs freaks me out. That glass is so tiny! Love the pickled snap peas. Never thought about pickling those before – sounds delicious with the ginger! Yes, it really is so tiny, we are still finding little pieces!! Thanks Kristy, you should give them a try! They are also great to serve with cocktails.